Continuing on from the first of this three part series, which is here in case you missed it, part two looks at things you need/might want to lock in over the next three to eight months of planning. 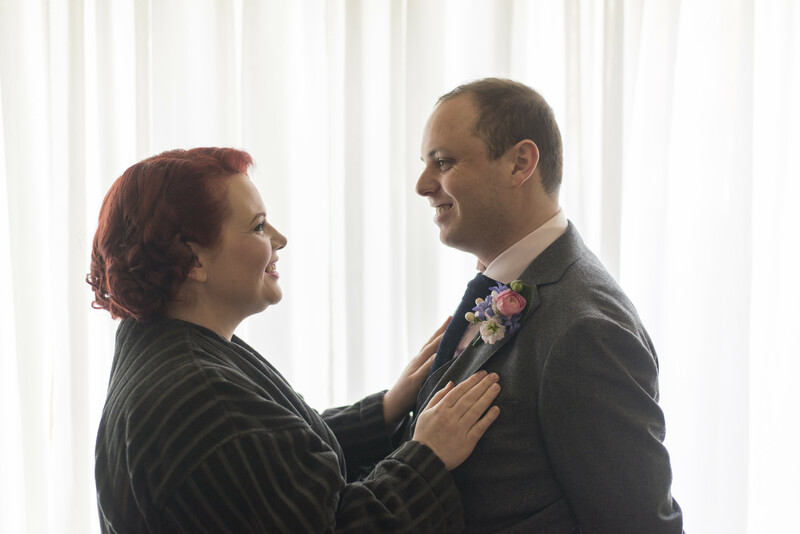 There is a little more to discuss this time, so I’ve tried to break it up with lots of pictures from our late winter/early spring wedding in August 2015. Don’t forget that when you’re planning and choosing everything to keep point numbers two and three – your budget and your theme/vibe – in mind. Full disclosure: We didn’t have all of these things, but we did consider them. There’s no hard and fast rule these days to who your bridal party consists of, how many people you have, whether there is an even number on each side, whether the same gender stands on the same side, flower girls and page boys, or even if you have a bridal party at all! Whomever you do choose to stand beside you on your day, make sure that it is someone you trust, someone you can turn to in times of need, someone who will accept your wedding planning craziness and not pass judgement, someone whom you do not feel obligated to have in your posse. Neither Alex or I could single one person out – not because they didn’t fit the criteria I’ve described, but because we couldn’t pick just one or two people. If you are going down this path – not having a bridal party – you will need to think about who you will have as your witnesses. We asked our brothers to be both our witnesses and ring bearers. Yes, I said outfits. Yes, I mean more than just the bride’s outfit (or maybe the bride will have multiple outfits! ): There’s also the groom’s outfit to consider, and any bridal party members. Remember to keep your budget and your wedding ‘vibe’ at the forefront of your mind as that can help with deciding on attire. If you’re going to purchase a gown from a bridal store, most stores need a minimum of six months to order in each gown. Stores tend to carry only one or two sizes of each style of dress. Don’t be disheartened if the floor stock doesn’t fit you, that’s why they need so long to order it in from their supplier, most of whom are overseas. This will allow for the manufacturing of the dress, shipping, and any alterations needed when it arrives. Another must do with bridal stores is to make appointments, especially if you’re planning on trying on gowns on the weekend. If you walk in without an appointment, expect to be turned away. If you’re going to have a gown made by a couturier, you may need to allow more than six months, depending on the detailing of the gown, and their existing workload. A couturier can design you a dress from scratch to your measurements and heart’s desire. Maybe you don’t want to buy a dress that you’ll wear once, maybe you want to buy a dress you can wear time and time again. Perhaps you’re not after a traditional gown: have you considered buying a dress from your favourite formal wear shop, or from a department/chain store, or even an online store? Unlike the days of old, there are no hard and fast rules for weddings other than to stay true to yourself (and the person you’re marrying, of course!). Bricks and mortar stores in Australia like Forever New, Portmans, City Chic, and Review have stunning collections of dresses suitable for most formal occasions, with Forever New and Review actually having separate ‘wedding’ ranges. 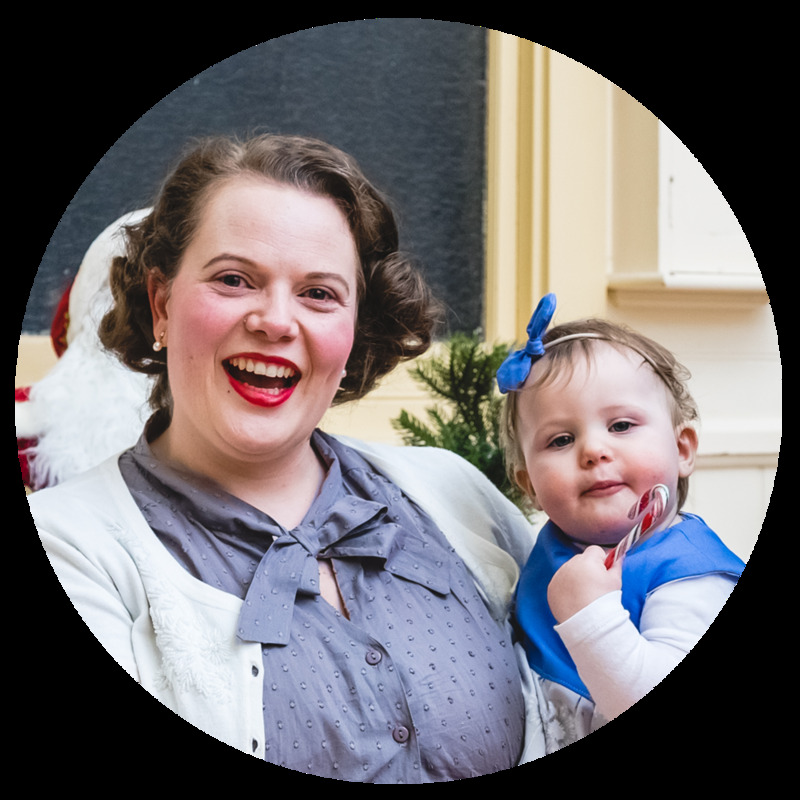 Online stores such as ModCloth, ASOS, Forever 21, Birdsnest, and Pinup Girl Clothing are fabulous for their range of dresses, with several of them also having wedding/formal ranges to choose from. Another option to consider is to buy second hand/used/vintage. Places like I Do Gowns, Still White and Savvy Brides in Australia – along with Facebook wedding buy, swap, and sell groups – sell second hand gowns, designer gowns none the less, for a fraction of their original price. Always handy when needing to keep the budget in check! 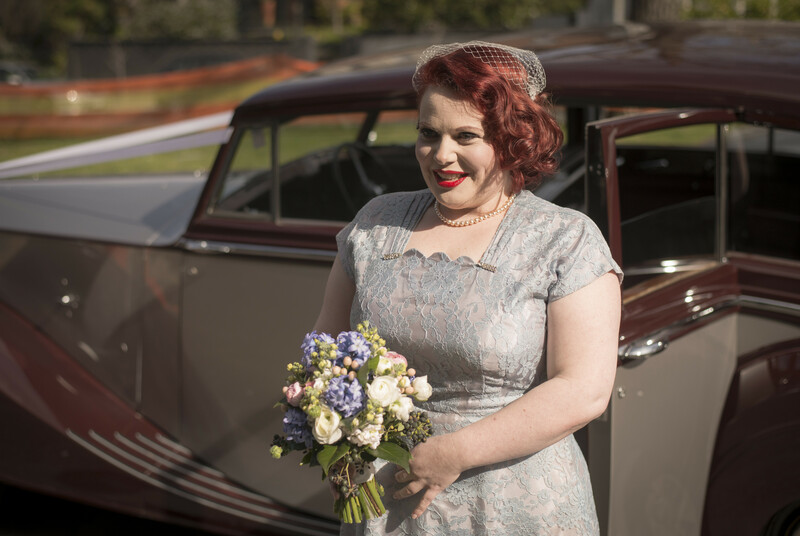 If you’re after a vintage dress – wedding or not – try Etsy. Type in your search parameters and happy scrolling! Seriously though, I bought my dress from Rust Belt Threads on Etsy. It’s a 1950s original. I knew I didn’t want a traditional wedding dress (and that had nothing to do with the fact that I had been married before) so it seemed only natural to me to find a dress on Etsy. 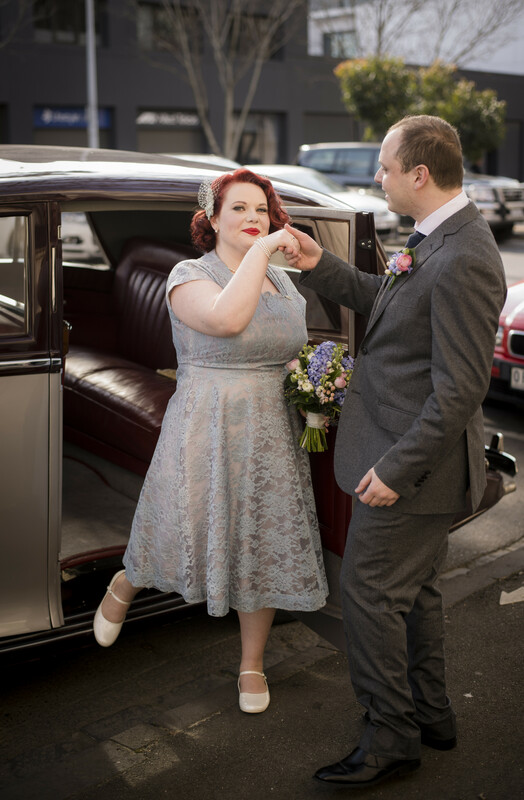 Thinking that I would have quite some difficulties in finding my dream dress, nine days after getting engaged, I set myself a goal of finding a vintage or vintage inspired blue lace/floral lace dress for $200 or less. 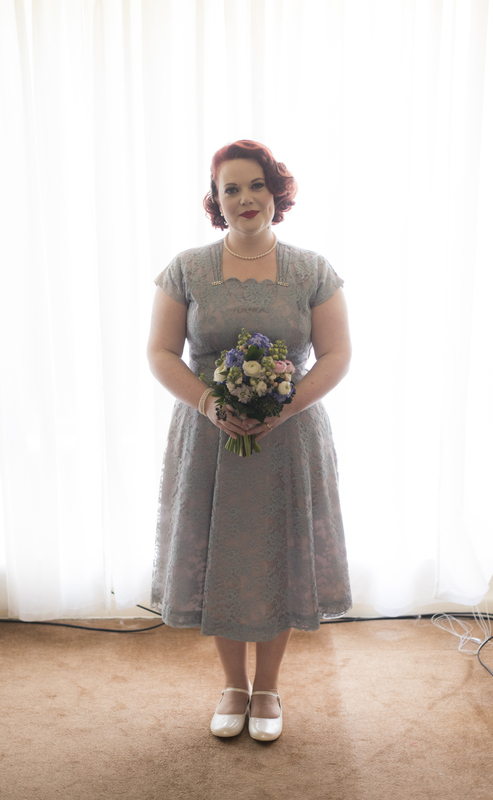 Within 24 hours of setting myself that goal, I found my dream dress: a blue vintage floral lace dress under $200 (including shipping and exchange rate conversion charges). Don’t rule out op shops too – I donated my first dress to an op shop, so someone will hopefully have gotten themselves a bargain. Of course, you might not want to wear a dress at all, perhaps you’re more comfortable in pants, or even your swimsuit! Wear what you want to wear, wear what you are comfortable in. Generally speaking, men’s attire is a great deal more straight forward than their female counterparts, and a lot of women have input into what the men will wear. Contemporary fashion does give men much more choice with their attire than before, wearing a black suit with a white shirt and a tie is not the be all and end all of men’s wedding attire. Of course if that is what you want, then rock it! Men’s suits and separates can be hired or purchased all across the world. We purchased Alex’s suit, shirt, and tie from M.J. Bale in the Boxing Day Sales (roughly eight months before our wedding) when we were actually buying a suit for his step-sister’s black tie wedding. We’d discussed what he’d like to wear, I told him to wear what he felt comfortable in but I also told him what I envisaged him in. I’m really lucky that he was on the same page: He wanted a wool three piece suit in grey, and that is exactly what we found. The best part was that it was about $300 less than its RRP – bargain! 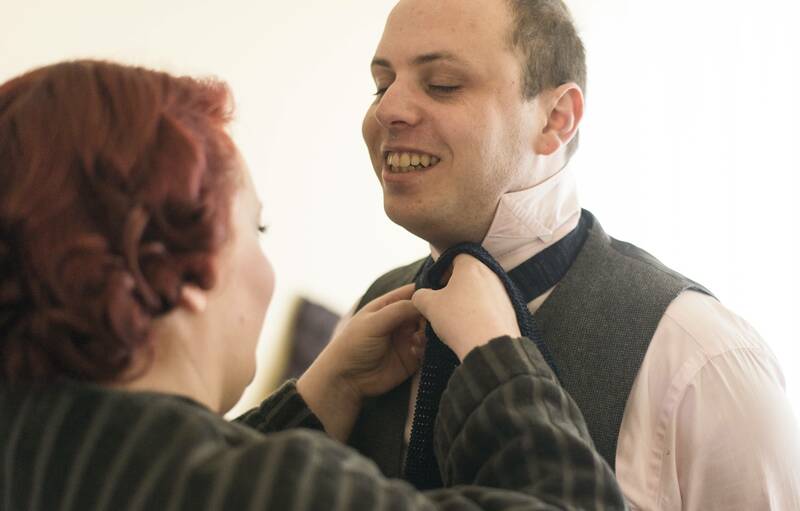 We knew that he would be wearing a pink shirt of some description but hadn’t found it at the time of the suit purchase, which was also when we purchased his gorgeous blue woven tie. We ordered his shirt from M.J. Bale’s online store after trying it in his size at Myer in a different colour, it was also less than the RRP. Money saved, win! As mentioned before with both the bride’s and groom’s attire, there are many different options for dressing your posse. One thing to bear in mind though is how your bridal party feel in a certain outfit: Will they be uncomfortable? Will they be self-conscious? Talking your ideas through with your bridal party will hopefully result in a more pleasant experience for all. The bridal party do not have to be dressed identically to anyone, or if you want a more uniform and cohesive look, that is entirely your choice. If you are hiring all the men’s outfits, the male bridal party attire can generally be ordered and measured at the same time as the groom’s. The same can be said if outfits are being purchased new. Women’s outfits can also be hired, made to order, or purchased outright. 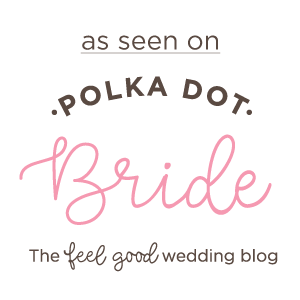 The links provided earlier for non-traditional wedding dresses are a great place to start. Co-contributing or asking your bridal party to pay for their outfits outright is not uncommon, just make sure they are aware of the costs ahead of time. Ah music, my friend. So many choices, yet only a few will suffice. Music is normally used for both the ceremony and the reception. If you are getting married in a church you may find you are restricted with your music selection, so be sure to speak with the officiant to clarify what you can and can’t have. 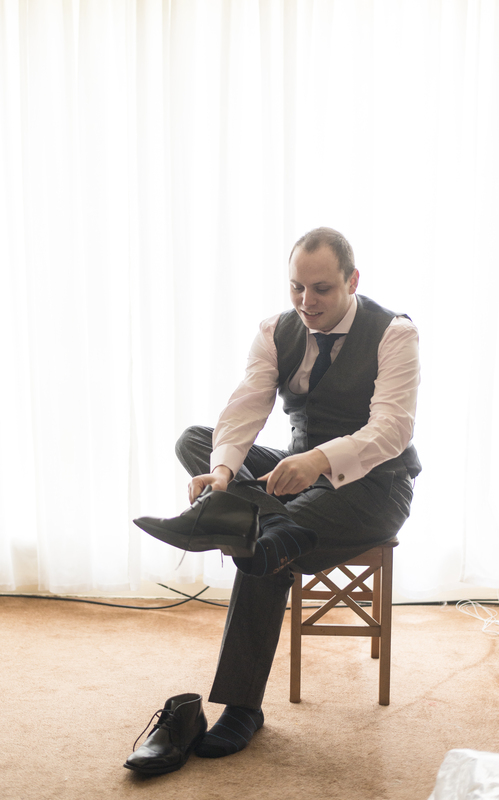 Civil ceremonies tend to be much easier with planning music: do you want a solo instrumentalist? A vocalist? A vocalist and an instrumentalist? Perhaps a string quartet is more to your liking? Or maybe you’d just like your favourite songs played through your celebrant’s P.A. system? So much choice! Receptions can also be restrictive if they are in a residential area, they may have noise curfews to adhere to. Be sure to check with them as you’d hate to have to cut your 12 piece band’s play time short, or perhaps your DJ. Again, like civil ceremonies, there is much choice when it comes to reception music. At our ceremony location, we had Alex’s uncle play the grand piano that was in the room (we got married in the Formal Music Room of Medley Hall) prior to the ceremony’s commencement. The rest of our music was played through our celebrant’s P.A. system. I walked up the aisle to More Than Life by Whitley, we signed the register to We’re Going To Be Friends by The White Stripes, and we walked down the aisle as a married couple to Home by Edward Sharpe and the Magnetic Zeroes. For some months, we compiled a list in Google Drive of songs that we’d like to play at our reception. 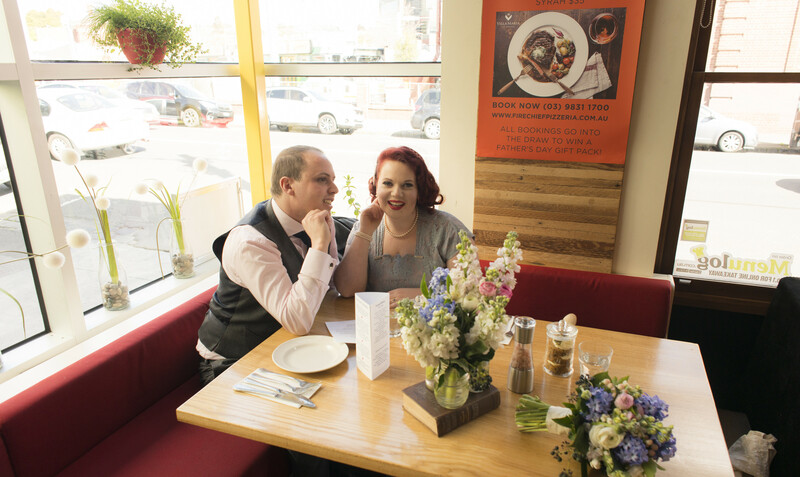 It was in the week before the wedding that we finalised our playlist on our laptop, but when we arrived at Firechief we were really happy with the music they were playing already, so we just rolled with that! 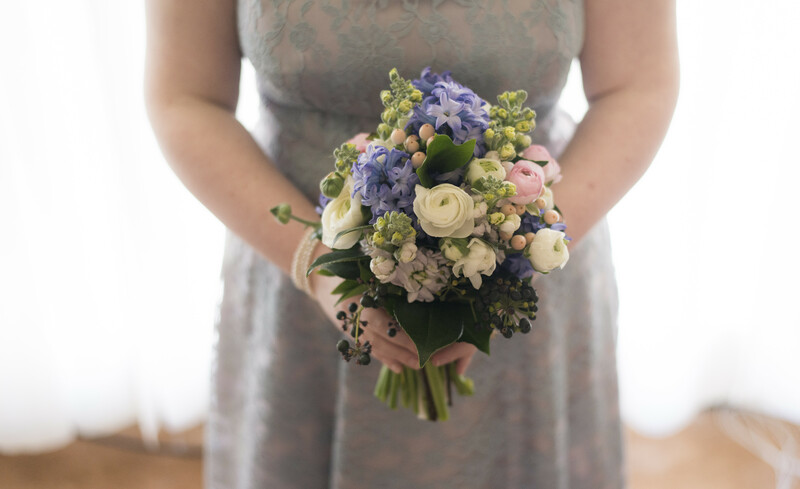 Flowers aren’t everyone’s cup of tea, but if you are going to have fresh blooms on your wedding day, organising them sooner rather than later is ideal. Like photographers and venues, a good florist can book out well in advance. Social media can be a great place to source florists in your local area, particularly Instagram, as well as inspiration. 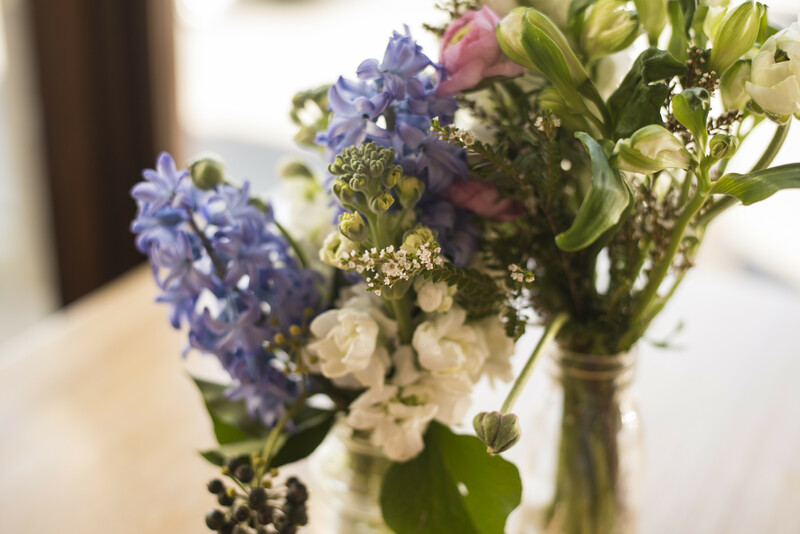 If you like pretty flowers but have no idea what is in season when you’re getting married, a great florist will be able to answer that question for you. Bear in mind that, if you want hydrangeas in winter or orchids in summer, you’ll be paying hefty prices for either: hydrangeas are a summer flower, while an orchid is a winter flower. We were slightly conflicted with who to have do our flowers: although my cousin is a retired florist (she’s not old, she’d just been in the game for a LONG time and wanted a career change) I wasn’t sure that I should ask her to do our flowers or not as we weren’t inviting her. I should have listened to reason as my cousin is awesome and understood perfectly well why she wasn’t invited. We don’t regret our decision one bit to have her do our flowers, they were absolutely perfect. Sure, I might be biased as she is my cousin but her work really is award-winning – she won Victorian Apprentice of the Year when she was in her first year in the early 90s, she took out several awards at the Interflora Florist of the Year Competition at Highpoint Shopping Centre in 2011 including first place for bridal design, and again taking the same award for bridal design at the same competition in 2012. And, in 2011 she was crowned Victoria’s ABIA Florist of the Year. Safe to say that our flowers were in exceptional hands. Our flowers consisted of hyacinth, ranunculi, sweet pea, astromeria, berries, and foliage. 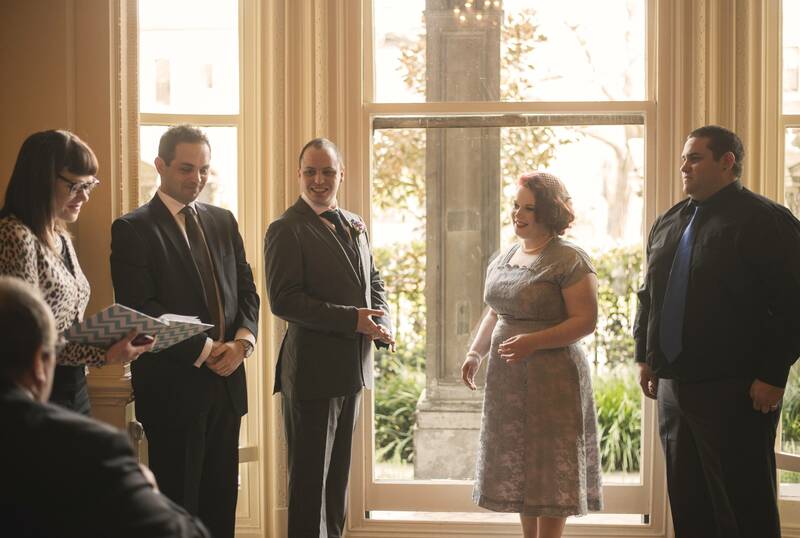 There was a very short gap between our ceremony and reception, about one and a half hours from memory. Cocktail hour started at Firechief 12pm, but we still needed to do photographs with family members. So that family members – and us – wouldn’t miss out on cocktail hour, we made sure we had a few Eskis with beer, wine, champagne, and sparkling apple juice for those who didn’t drink (both Alex’s brother’s wife and my brother’s wife were pregnant at the time, and neither Alex or I drink much alcohol). You may also like to provide some snacks if it’s going to be a little while between ceremony and reception. Perhaps not as essential if you’ve booked a reception centre that does all the catering – they will have set menus and dishes for you to select from – but if you are hiring caterers, you will need to think about the sort of food you want served. Will you have a buffet? Will you have a three course sit down meal? Will you do a pot luck? The same can be said for beverages: Do you have an open bar? Do you provide only beer, wine, and soft drink (and tea and coffee), with guests paying for other alcohol? Do you ask guests to pay for their own beverages? If you have a reception centre, they will contact you a few months before hand to finalise your menu choices. You may even be lucky enough to have a reception centre who provide tasting days before you make your selections! Firechief were amazing and worked with us every step of the way: we had a tapas-style shared entrée for each table, a reduced a la carte menu for mains (guests could choose from six different dishes), and a tapas-style shared dessert as well. It worked brilliantly. We had an open bar, though a lot of our guests didn’t realise, as this was the best value for money plus we wanted our guests to be well looked after. DIY or have someone else make it for you? If you are having your reception at a reception centre a lot of places won’t accept cakes or food from an external source unless they can supply accreditation, for example food handler’s and food safety certifications. Be sure to check their requirements. Social media again is a great place to source cake makers and inspiration, as is Googling cake makers in your local area. There are so many different types of cakes out there – rustic, formal, informal, and so much more. Be realistic about your choice too: There are ways to fake that 5 tiered cake and avoid wastage and save yourself a whole lot of money. Something else that is becoming increasingly popular is cake jars (though a lot of our guests had never heard of them!). 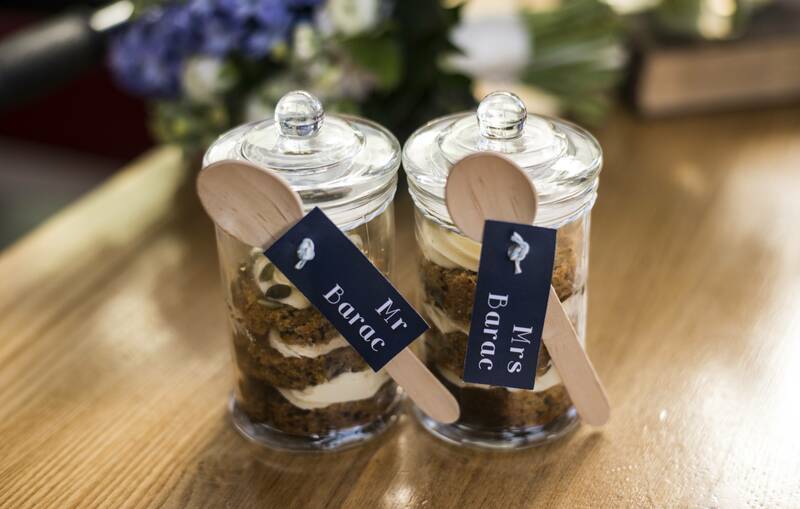 In keeping with our fuss-free ‘theme’, we did away with a ‘traditional’ cake and opted instead for cake jars. They killed three birds with one stone: bonbonnière, place card, and cake. My best friend made the cake and the frosting, and together her, Alex, and I assembled them. Delicious carrot cake with cream cheese frosting and pumpkin seeds. Last but definitely not least for this segment is transport. We’ve all got to get from A to B and sometimes from B to C and then back to A, so transport is essential. Car? Horse drawn carriage? Vintage bus? Truck? Motorcycle? Bicycle? Tram? Taxi!? Drive yourself? Your list of transportation options is as long as you can imagine. Things to consider when booking your transport is how long do you need it for – what time is the first collection, and from where? How many people do you need transported from A to B, and then B to C, and so on and so forth? Larger bridal parties may require several cars or one large (i.e. stretched or super stretched limousines) car, whereas smaller parties may only require one or two. One thing I do strongly recommend if your budget allows is for the married couple to have a vehicle to themselves. Although your wedding day is a day to celebrate your love and devotion to each other, you rarely get any time to bask in your newlywed glory just on your own. This way, while you’re being ferried around by a chauffeur, or even if you’ve opted to drive yourself, you can have some alone time to reflect on your ceremony. Upon hearing that I had planned on hitching a ride with our photographer (Alex was driving himself to our ceremony location, and then we’d go together to our reception), very dear friends of ours went and booked a car as our wedding gift. They told us the company they booked from and directed us to their website so we could select the vehicle we wanted. We went with a 1949 Rolls Royce Silver Wraith in burgundy and silver. Alex didn’t see the car until I arrived when we had our First Look before the ceremony. So, that wraps up part two. 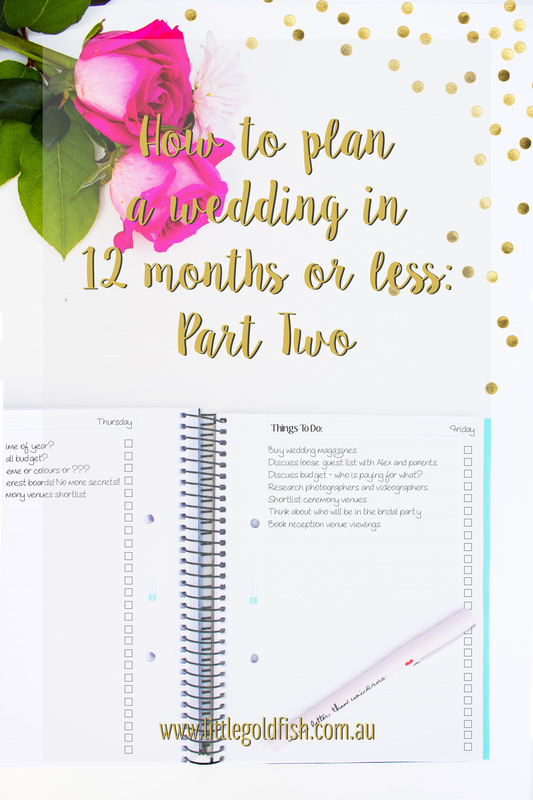 A little lengthy, but those middle months of planning do take a lot of consideration. Part three will be here in a few weeks’ time, so stay tuned for more (don’t forget the exclusive reader only discount code and new product that I’ll be releasing with part three)! 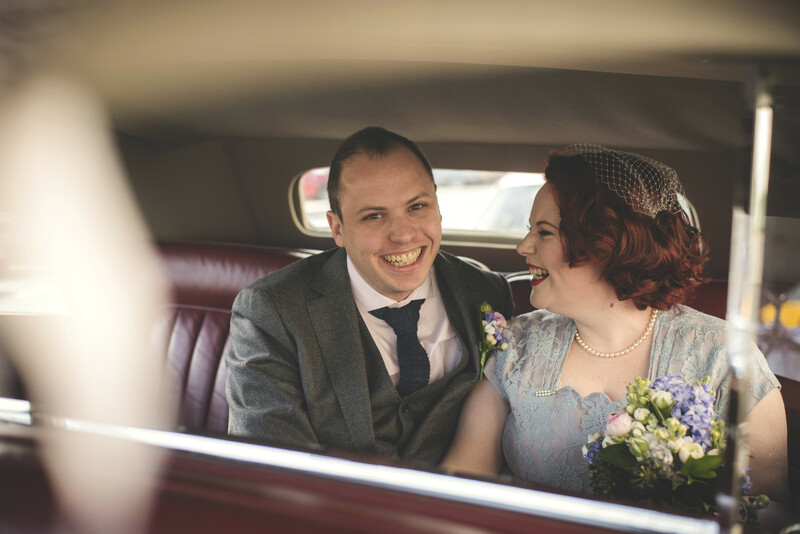 Our wedding photography is thanks to Clare Metcalf Photography.